Image supplied by kind permission of Bourne Fine Art. Oil on canvas 60 x 75 cm. Exhibited at the Royal Academy 1875 and the Royal Scottish Academy 1876. The background scenery is taken from that around Gatehouse-of-Fleet. John Faed like to holiday at Carrick perhaps the first of the many artists, who appreciated the beauty of the area. 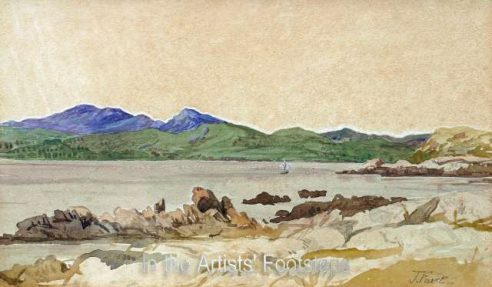 It was from Carrick cottage that Faed wrote to the young E A Hornel: "I look upon it as a reflection on the character of any local artist than he is unaccounted with this bonny bit of Borgue shore." Many of Hornel’s works are set along the Borgue shore, particularly at Brighouse Bay. Dorothy L Sayers sets an incident in The Five Red Herrings on the shore at Carrick. By kind permission of Bourne Fine Art. This is a smaller version of the painting of the Battle of Blenheim exhibited at the Royal Academy in 1875. The painting here differs from the larger version in a number of subtle ways. The colours seem richer and there are added touches of colour as on the geraniums on the window. The view from Faed’s house over Gatehouse, which is the basis for the landscape is more clearly delineated in this work. 7.25 by 7.9 inches. Engraved by Henry Lemon. 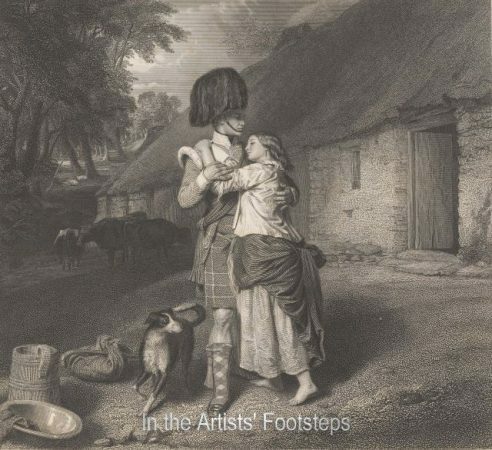 From The Soldier’s Return by Robert Burns, illustrated by John Faed RSA. Published in Edinburgh for the Members of the Royal Association for the Promotion of the Fine Arts in Scotland, 1857. The engraving illustrates the lines "She gaz’d, she redden’d like a rose, Syne pale like ony lily, she sank within my arms, and cried, Art though my ain dear Willie". 6 by 7.9 inches. Engraved by James Stephenson. The engraving illustrates the lines "Wha spied I but my ain dear maid, Down by her mother’s dwelling! and turned me round to hide the flood That in my een war welling". 6.25 by 7.9 inches. Engraved by James Stephenson. This engraving illustrates the lines "At length I reached the bonny glen, Where early life I sported". Faed has used the local Cardoness Castle to remind the soldier of his home. 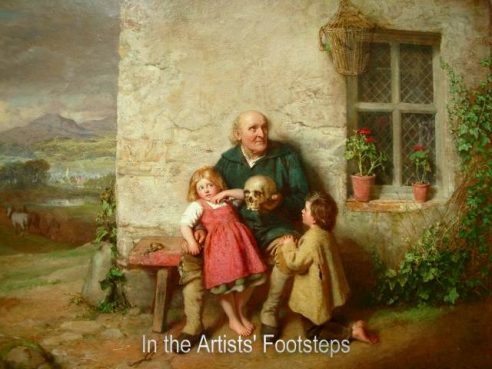 This self portrait shows the artist as an old man. Oil on canvas 102 by 141 cms. Image reproduced courtesy of South Ayrshire Council. 7.9 x 6 inches. Engraved by Lumb Stocks, RA. 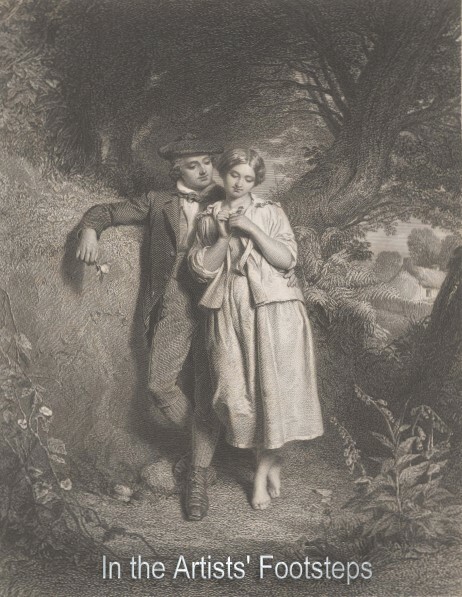 This engraving illustrated the lines "I pass’d the mill and trysting thorn, Where Nancy aft I courted". The words are an echo of John Faed’s own childhood at Barlay Mill, Gatehouse. 6 by 7.9 inches. Engraved by Henry Lemon. This engraving illustrates the lines "Wi’ mony a sweet babe fatherless, and mony a widow mourning". 6 by 7.9 inches. Engraved by Lumb Stocks, RA. The engraving illustrates the lines "Sae wistfully she gaz’d on me, and lovelier was than ever; Quo’ she, a sodger once I lo’ed, forget him shall I never". The building in the background was used in other Faed paintings including The Auld Mare Maggie. 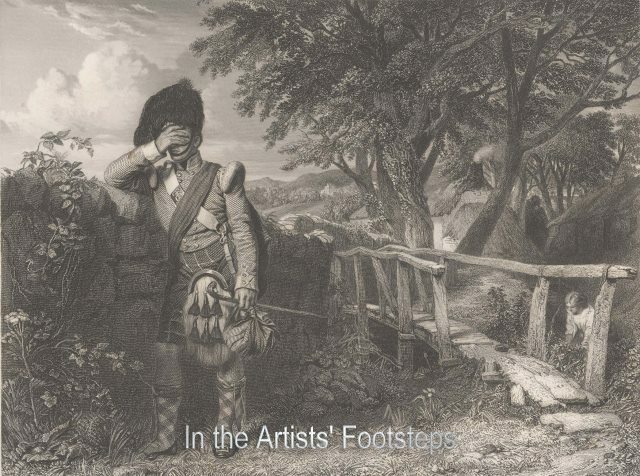 The successful publication of The Cotter’s Saturday Night illustrated by John Faed led to commissions to illustrate Robert Burn’s Tam O’ Shanter and The Soldier’s Return. In all these works John Faed relied heavily on the people and places of his native Gatehouse to illustrate his paintings. The work shown here differs somewhat from the engraved work suggesting that it was painted independently of the published work. Image kindly supplied by Bourne Fine Art. 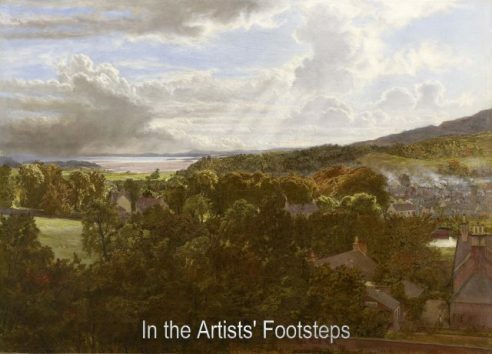 A view from the artist’s studio at Ardmore looking up the valley of the Fleet. The original is owned by the National Trust for Scotland, and thanks are due to the Trust for permission to reproduce this image. 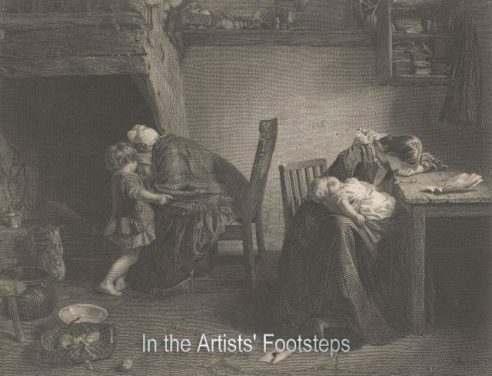 The Wappenschaw was first exhibited at the Royal Scottish Academy in 1863 and again in 1867 as well as in the special exhibition in 1976 to mark he 150th anniversary of the RSA. When shown in the Royal Academy in 1866 it was praised by the Art Journal as the best picture in the exhibition. A Number of the models used in the picture are Gatehouse people, seen in other works by John Faed, such as Sandy Inglis seen hear loading a gun for the next contestant in the shooting match. There is a smaller version of the painting, an oil on canvas measuring 45 by 76cm in the Atkinson Gallery, Southport, Merseyside. The picture is entitled the Shooting Match. Another small version, measuring 38.7 by 56.3 cm sold for £56,460 at Christies, sale 5969, lot 22 on 12/12/2012. View of Gatehouse from the artist’s house, Ardmore. 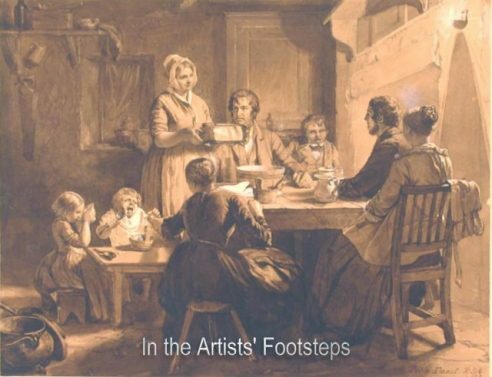 A substantial work measuring 11 by 12 feet, it was painted for the people of Gatehouse and was hung in the Town Hall from its opening in 1885 to the demolition of the Hall a century later. In the foregroud we see the town of Gatehouse representing the present; in the middlegroud Rutherford Monument and Cardoness Castle remind us of the past and the large expanse of sea and sky beyond look to the future. A finished study of the View over Gatehouse is in the Kelvingrove Art Gallery, Glasgow. Born at Barlay Mill, Gatehouse of Fleet. Died at Ardmore, Gatehouse of Fleet, which he built in 1867. Divided his time between Gatehouse and London before settling permanently at Ardmore 1880. Trustees Academy, Edinburgh, although largely self taught. Royal Academy; Royal Scottish Academy; Royal Glasgow Institute of Fine Arts. Member of the Smashers’ Club. President of the Kirkcudbright Fine Art Association. Gave encouragement to Hornel and his colleagues. The Faeds, Mary McKerrow, Edinburgh, 1982. The Gatehouse Years, David I A Steel, 2002. 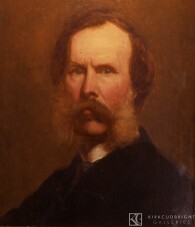 Self portrait provided by Stewartry Museum. Began to paint miniatures at an early age. Left for Edinburgh in 1840. Followed his brother Thomas to London but always longed for Gatehouse of Fleet. Built a house there in 1867 and settled permanently in 1880. Illustrated The Cottar’s Saturday Night, Tam O’ Shanter and The Soldier’s Return for the Fine Arts Association. His self portrait, The Little Seamstress and other works are in the Stewartry Museum, Kirkcudbright. A Family Meal appears to be one of the works prepared for the Cottar’s Saturday Night. A small View over Gatehouse of Fleet is illustrated in Bourne p23 (see bibliography). The Pedlar, signed and dated 1874 sold at Christies, Edinburgh, 26/10/06, Sale 7299, lot 112. A water colour On the Dee South of Castle Douglas, sold by Lyon and Turnbull, sale 182, lot 31, 12 July 2007. An oil painting Gatehouse of 1886 was sold for £2400 at Bonhams Scottish sale 29/08/2008, lot 1075. A fine portrait of the 1850s The Sportsman, was sold at Bonhams, Edinburgh, for £13,800 on 21 April 2011, sale 18818, lot 21. John Faed, the eldest of the six children of James Faed and Mary McGeoch was born at Barlay Mill, Gatehouse in 1819. He showed early artistic promise and by the age of nine was painting miniatures of the local dignitaries. He was encouraged in his work by the family of William Campbell, who had settled in Gatehouse and in whose house he learned to paint miniatures on ivory. He was also encouraged by Lord Kenmure, who, on a visit to Gatehouse was impressed with the boy’s work and gave him his own box of water colours. John left Gatehouse for Edinburgh in 1840 to pursue his career and had his first work accepted at the Royal Scottish Academy the following year. 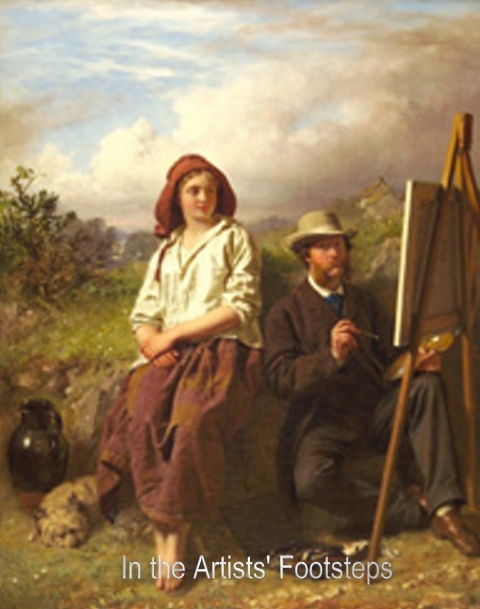 John Faed continued to exhibit at the RSA till 1895. He became an associate member in 1847 and a full member in 1851. Following his father’s death in 1842 John encouraged his brother Thomas to come to Edinburgh where he helped to finance his studies. 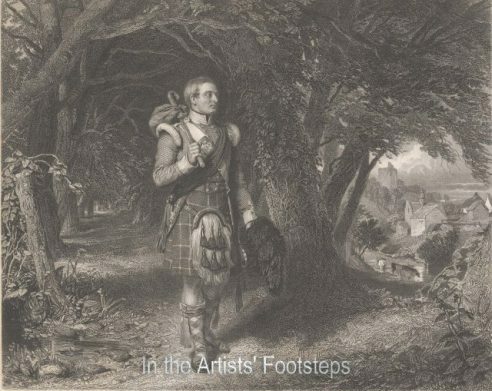 While Thomas Faed moved to London in 1851, John remained in Edinburgh, where he painted scenes from Scottish history and drew inspiration from the works of Burns, Scott and Shakespeare. In the mid 1850s he was commissioned to illustrate The Cottar’s Saturday Night, Tam o’ Shanter and the Soldier’s Return. In 1864 John Faed also went to London but the call of his native Galloway remained strong and in 1867 he bought a plot of land on the outskirts of Gatehouse and built a house there. After spending the summers in Gatehouse and the winters in London he finally settled permanently in the town in 1880. As he himself said: “Finding that the class if subjects that I was then engaged with required country models, and Gatehouse could supply them of all ages, in perfection, I finally decided to leave London.” Among his favourite models was the retired local farmer Sandy Inglis , who can be seen in many of John’s works including The Old Mare Maggie and The Battle of Blenheim. 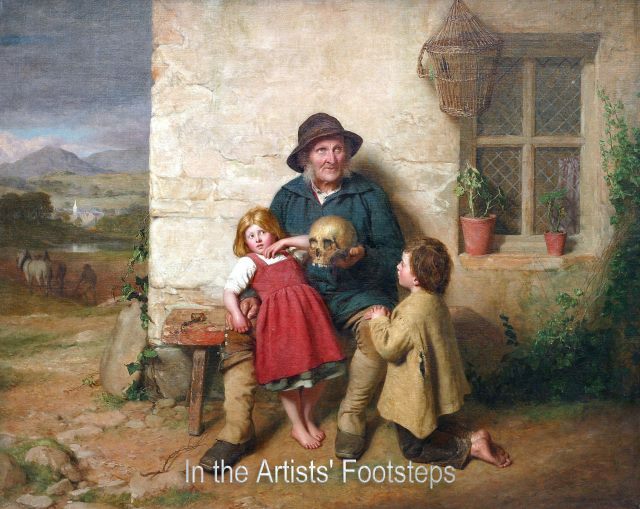 In his old age in Gatehouse John Faed remained an inspiration for the new generation of Kirkcudbright artists. 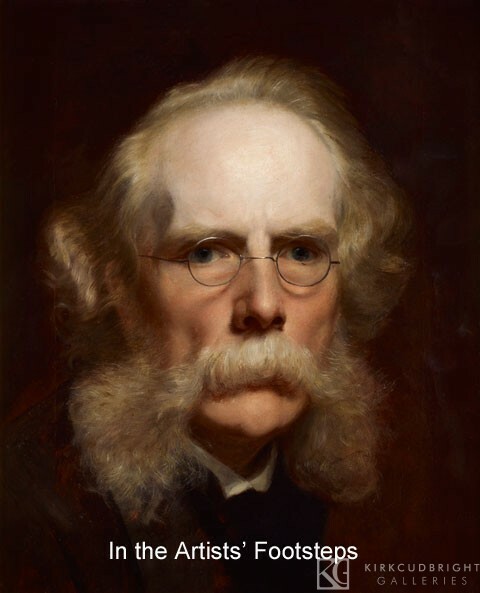 He was President of the Kirkcudbright Fine Art Association, which was set up by Hornel and other young artists returning to Kirkcudbright in 185 after training in Edinburgh and in Antwerp. Faed encouraged Hornel and advised the young MacGeorge and his colleagues not to take any notice of the local critics of their work. In the year 1885 he painted his large View over Gatehouse for the Town Hall, which was opened by his brother Thomas. John Faed died at Ardmore, Gatehouse on 22 October 1902 at the age of 83. John Faed was born in 1819 and showed early artistic promise, beginning to paint miniatures of the local dignitaries by the age of nine. In 1840 he left Gatehouse to further his career in Edinburgh and had his first work accepted by the RSA in 1841. He continued to exhibit till 1895, becoming an associate Member of the RSA in 1847 and a full Member in 1851. He is best remembered for his historical paintings and his many works, which draw their inspiration from Scott, Burns and Shakespeare. Thomas, born 1825, followed his brother to Edinburgh in 1842, where he studied at the Trustees Academy. He first exhibited at the RSA in 1844. Before long Thomas and John were joined by James, born 1821 and George Faed, born 1830, who took up careers as engravers. George Faed died in 1852. Thomas moved to London, becoming an associate of the Royal Academy in 1861 and a full Member in 1864. In that year John also moved to London, but in 1867 he bought a plot of land in Gatehouse and after spending summers there and winters in London, finally settled in Gatehouse in 1880. 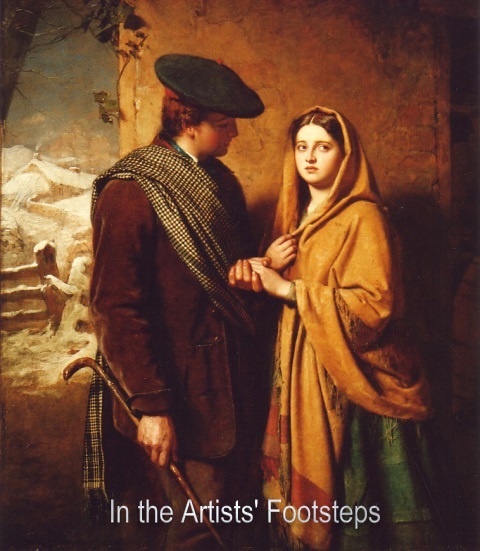 Thomas Faed’s best known work is The Last of the Clan, which has become an iconic symbol of Highland emigration. Other works recalling the emigration of members of his own family such as Sunday in the Backwoods became popular as engravings on both sides of the Atlantic. James Faed became a successful engraver, executing over 140 plates for many of the leading artists of the day, but like his brothers he never lost his love of Galloway and continued to paint here and owned a property in Wigtownshire in the 1870s. Susan Faed, born 1827 also painted and had works exhibited at both the Royal Academy and Royal Scottish Academy. Thomas Faed died in 1900 and John in 1902. Susan continued to live in Gatehouse till her death in 1909. James died in Edinburgh in 1911. He had a large family , a number of whom followed an artistic career, notably James Faed, junior, who is best remembered for his Gallloway landscapes.